Vietnam has seized around a ton of pangolin scales and ivory hidden inside dozens of boxes on a flight from Nigeria, state media reported, a haul highlighting the illegal wildlife trade routes connecting Africa and Southeast Asia. Both the ivory and pangolin trade have been banned in Vietnam. But weak law enforcement in the communist state has allowed a black market to flourish and feed into a global multibillion dollar industry in animal parts and exotic pets. Southeast Asian countries have become a busy thoroughfare for tusks trafficked from Africa and destined for other parts of Asia, mainly China. Pangolins are treasured in Vietnam and the region for their meat and alleged medicinal properties of their scales. Authorities at Hanoi’s airport found 805 kilograms of pangolin scales as well as 193 kilograms of ivory and ivory-derived products in two dozen boxes on Friday, said a report in the official newspaper of the customs department. The goods were sent from two companies based in Nigeria, according to the labelling. They had arrived on a September 21 flight but were never picked up. “The (intended) recipients of the cargo package have refused to receive the goods,” the article said. 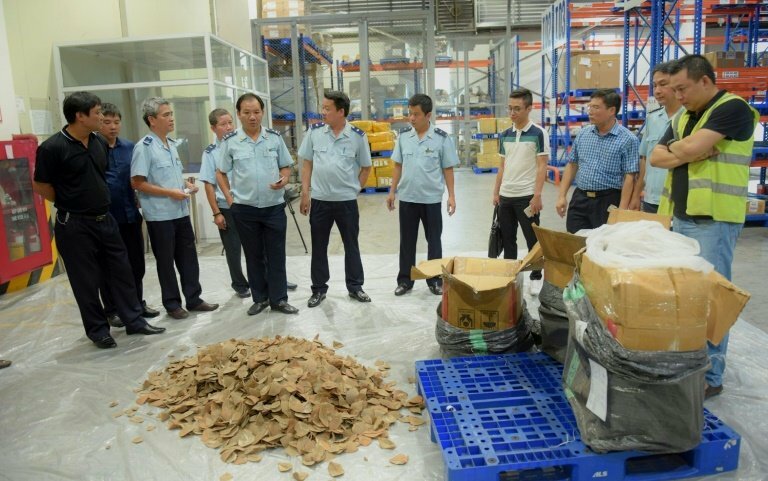 Photos showed a pile of the pangolin scales on the floor as inspectors went through the boxes, which were initially covered in an extra layer of wrapping and taped shut. The tiny and shy pangolin, which resembles a scaly anteater, is the world’s most heavily trafficked mammal and despite bans the trade remains rampant. Vietnam outlawed the ivory trade in 1992 but illegal trade still persists and shops sell ivory pre-dating the ban for decorative and medicinal purposes. The haul is the latest to make headlines in Vietnam, where seizures are infrequent but usually large. Last year police found 2.7 tonnes of tusks inside cartons on the back of a truck in the central province of Thanh Hoa. In October 2016 customs officials in Vietnam discovered about 3.5 tonnes of elephant tusks at Cat Lai port in Ho Chi Minh City.